Garry Ultra Light Upright Vacuum claims to be a professional quality, ultra light vacuum cleaner with a high suction capacity. The vacuum also claims the ability to purify air. 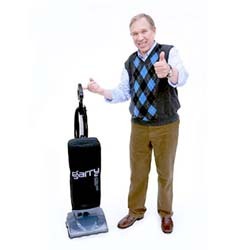 Gary Ultra Light Upright Vacuum weighs 9lbs. With your help we can reach more people and let them know about Garry Ultra Light Upright Vacuum whether this product works or not. I ordered this Christmas 2010 used it for a year until the fan in it broke now bags and parts are free to replace with the warranty so I called cust service for a replacement which they said it free but it is going to cost $50.00 for shipping. What a ripoff the fan weighs about 1/2 lb. Oh by the way the free bags for like cost $9.99 for shipping every month. So good vac but a ripoff with what they advertise as free.